Do your envelopes, packages and products need some pop? Glossy Crystal Clear Address Labels are the clear solution to plain mailing and packaging. 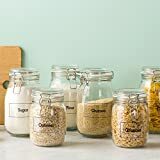 The crystal clear labels virtually vanish when applied to clear glass and plastic, dark paper, and cellophane, making them wonderful for special occasions, events, product packaging and branding. 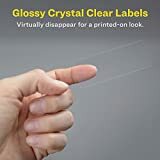 These clear stickers are also superb for giving a sleek, professionally printed-on look to light-colored and white envelopes, glossy paper, glossy cardstock and photo paper. 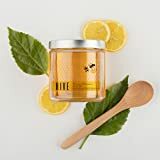 A glossy sticker is also great for paper crafts, glass bottle labels, Mason jar labels, food containers labels and more. 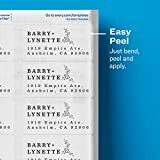 Ultrahold permanent adhesive sticks and stays on envelopes, paper, plastic, glass, metal and more without curling, peeling or falling off. 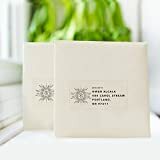 An innovative Easy Peel design makes these envelope stickers easy to peel and quick to apply. 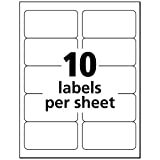 Just bend the label sheet, peel off and fold the sheet back to flat. Easily add that personal touch with free templates and your own designs at avery.com/templates. Compatible with laser and inkjet printers. 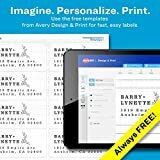 This pack of 100 Avery Shipping Labels makes it simple to add an elegant and upscale aesthetic to all your mailing, packages, branding, crafts and more. 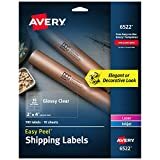 Interested in the Avery Glossy Crystal Clear Address Labels for Laser & Inkjet Printers, 2" x 4", 100 Labels (6522)? Is the price too high? You can easily price watch this product and we'll notify you when the price reaches your target.